St Toribio, or Turibius Alphonsus Mogrobejo, was second son to the lord of Mogrobejo, and born in the kingdom of Leon, on the 16th of November, in 1538. From his infancy he discovered a strong inclination to piety; and in his childhood it was his delight, at times of recreation, to erect and adorn altars, and to serve the poor. He trembled at the very shadow of sin. One day, seeing a poor peddler woman angry because she had lost something out of her pack, he most movingly entreated and exhorted her that she would not offend God by passion; and, in order to appease her, gave her the value of her loss, which he had begged of his mother for that purpose. He was very devout to the Blessed Virgin, said every day her office and rosary, and fasted every Saturday in her honour. Whilst at school, he usually gave part of his slender dinner to the poor, and was so much addicted to fasting that his superiors were obliged, by strict commands, to compel him to moderate his austerities. He began his higher studies at Valladolid, but completed them at Salamanca. He was introduced early to the notice of King Philip II, honoured by him with several dignities, and made president or chief judge at Granada. This office he discharged during five years with so much integrity, prudence, and virtue that the eyes of the whole kingdom were fixed on him, and his life in the world was a holy noviceship to the pastoral charge. The pressing necessities of the infant church of Peru required a prelate who inherited, in a distinguished manner, the spirit of the apostles; and the archbishopric of Lima falling vacant, Turibius was unanimously judged the person of all others the best qualified to be an apostle of so large a country, and to remedy the scandals which obstructed the conversion of the infidels. The king readily nominated him to that dignity, and all parties concerned applauded the choice. Turibius was thunderstruck at this unexpected news, and had no sooner received the message but he cast himself on the ground at the foot of his crucifix, praying, with many tears, that God would deliver him from so heavy a burden, which he thought absolutely above his strength. He wrote the most urgent letters to the king's council, in which he pleaded his incapacity, and other impediments, and laid great stress on the canons, which forbid laymen to be promoted to such dignities in the church. This humility it was that obtained the succor of heaven by which he performed wonders in the service of souls. Being compelled by obedience to acquiesce, he at length testified his submission by falling on his knees and kissing the ground. After a suitable preparation, he received the four minor orders on four successive Sundays, the better to dispose himself for the functions of each; and after passing through the other orders, he was consecrated bishop. Immediately after which he set out for Peru, and landed at Lima, in the year 1581, of his age the forty-third. That diocese is extended one hundred and thirty leagues along the coast, comprising three cities and many towns and villages, with innumerable cottages scattered over two ridges of the mountains of the Andes, esteemed the highest and the most rugged in the whole world. Some of the European generals, who first invaded that country were men who seemed to measure every thing by their insatiable avarice and ambition, and had so far lost all sentiments of humanity towards the poor savages, that they deserved the name rather of tyrants and plunderers than of conquerors. Civil wars and dissension completed the misfortune of that country; and covetousness, cruelty, treachery, fraud, and debauchery seemed triumphant. Nor were the repeated orders of the Spanish court able to redress these evils. The sight of these disorders moved the good pastor often to tears, but his prudence and zeal overcame all difficulties, extirpated public scandals, and made the kingdom a flourishing portion of the Christian church. 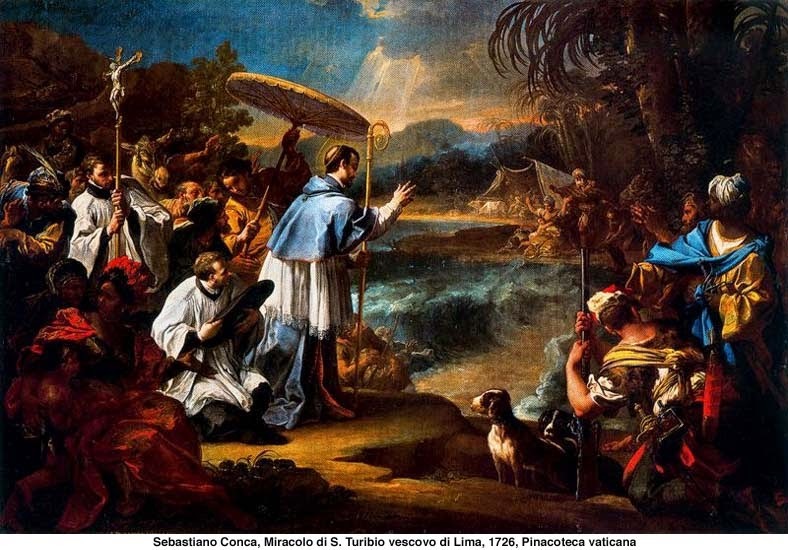 Upon his arrival, he immediately began a visitation of his vast diocese- an undertaking of incredible fatigue, and attended with many dangers. He often crept over the steepest and most rugged mountains, covered with ice or snow, to visit some poor hut of Indians, and give them suitable comfort and instruction. He travelled often on foot, and sometimes barefoot, and by fasting and prayer never ceased to implore the divine mercy for the salvation of the souls committed to his charge. He placed everywhere able and zealous pastors, and took care that no one in the most remote corners of the rocks should be left destitute of the means of instruction and of the benefit of the sacraments. To settle and maintain discipline, he appointed diocesan synods to be held every two years, and provincial synods every seven; and was vigilant and severe in chastising the least scandal, especially of avarice, in the clergy. Without respect of persons, he reproved injustice and vice, and made use of all the means which his authority nut into his hands, to check the insolence of public sinners, and to protect the poor from oppression. Many of the first conquerors and governors of Peru, before the arrival of the most virtuous viceroy Francis of Toledo, were men who often sacrificed every thing to their passions, and for their private ends. From some of these the saint suffered many persecutions, and was often thwarted by them in the discharge of his duty. But by the arms of meekness and patience he overcame all affronts and injuries, and with an invincible constancy he maintained the rights of justice and truth. He showed that many sinners misconstrued the law of God to make it favour their passions; but that, as Tertullian observes, "Christ calls himself the truth, not custom," and will weigh our actions not in the false balance of the world, but in the true scales of the sanctuary. Thus he extirpated the most inveterate abuses, and established with so great fervour the pure maxims of the gospel, as to revive in many the primitive spirit of Christianity. To extend and perpetuate the advantages of religion, which by his zeal he had procured, he filled this country with seminaries, churches, and many hospitals; but would never suffer his own name to be recorded in any of his munificent charities or foundations. When he was at Lima, he every day visited several hospitals, comforted and exhorted the sick. and administered the sacraments. When a pestilence, though that calamity is seldom known in Peru, raged in some parts of his diocese, Turibius distributed his own necessaries in relieving the afflicted: he preached penance, because sins are the cause of chastisements, and infinitely the worst of evils. He walked in the processions, bathed in tears, with his eyes always fixed on a crucifix, and offering himself to God for his flock; fasted, watched, and prayed for them without intermission, till God was pleased to remove the scourge. Nothing gave the saint so much pleasure as the greatest labours and dangers, to procure the least spiritual advantage to one soul. Burning with the most vehement desire of laying down his life for his flock, and of suffering all things for him who died for us, he feared no dangers. When he heard that poor Indians wandered in the mountains and deserts, he sought them out; and to comfort, instruct, or gain one of them he often suffered incredible fatigues and dangers in the wildernesses, and boldly travelled through the haunts of lions and tigers.1 He spent seven years in performing his first visitation; his second employed him four years, but the third was shorter. He converted innumerable infidels, and left everywhere monuments of his charity. In travelling, he either prayed or discoursed on heavenly things.. On his arrival at a place, it was his custom to repair first to the church to pray before the altar. To catechise the poor, he would sometimes stay two or three days in places where he had neither bed nor any kind of food. He visited every part of his vast diocese, and when others suggested to him the dangers that threatened him from rocks, precipices, marshes, rivers, robbers, and savages, his answer was that Christ came from heaven to save man, we ought not therefore to fear dangers for the sake of immortal glory. He preached and catechised without intermission, having for this purpose learned, in his old age, all the various languages of the barbarous nations of that country. Even on his journeys he said mass every day with wonderful fervour and devotion. He always made a long meditation before and after it, and usually went to confession every morning; though they who best knew his interior testified that they were persuaded he had never in his whole life forfeited his baptismal innocence by any mortal sin. He seemed to have God and the divine honor alone before his eyes in all his words and actions so as to give little or no attention to any thing else; by which means his prayer was perpetual. He retired in private to that exercise often in the day, and for a long time together. In it his countenance seemed often to shine with a divine light. The care with which he studied to disguise and conceal his great mortifications and works of piety, was the proof of his sincere humility. His munificence in relieving the poor of every class, especially those who were too bashful to make their necessities publicly known, always exhausted his revenues. The decrees of his provincial councils are monuments of his zeal, piety, learning, and discretion: they have been ever since esteemed, not only in the new world, but also in Europe, and at Rome itself, as oracles. The flourishing state of the church of Peru, the great numbers of saints and eminent pastors with which it abounded, and the establishment of innumerable seminaries of piety and learning, and hospitals for the poor, were the fruit of his zeal. If he did not originally plant the faith, he was at least the great propagator of it, and the chief instrument of God in removing scandals and advancing true piety in that vast country, which till then had been a land of abominations: whilst Francis of Toledo, the great viceroy, first settled the civil government in peace and tranquillity by salutary laws, which have procured him the title of the Legislator of Peru. St. Turibius, in the sixty-eighth year of his age, in 1606 during the visitation of his diocese, fell sick at Santa, a town one hundred and ten leagues distant from Lima. He foretold his death, and ordered him to be rewarded who should bring him the first account from his physician that his recovery was despaired of. The ardour of his faith, his hope, his love of his Creator and Redeemer, his resignation, and perfect sacrifice of himself, gathered strength in the fervent exercises and aspirations which he repeated almost without ceasing in his illness. By his last will he ordered what he had about him to be distributed among his servants, and whatever else he otherwise possessed to be given to the poor. He would be carried to the church, there to receive the holy Viaticum, but received extreme unction in his sick bed. He often repeated those words of St. Paul, <I desire to be dissolved, and to be with Christ>; and in his last moments he ordered to be sung by his bedside those of the Psalmist, <I rejoiced in the things that were said to me: we shall go into the house of the Lord.> He died on the 23rd of March, repeating those other words of the same prophet, <Into thy hands I commend my spirit.> His body being translated the year after to Lima, was found incorrupt, the joints flexible, and the skin soft. His historian, and the acts of the canonization, mention many sick restored to their health, and a girl raised to life by him whilst he was living; also many miracles wrought through his intercession after his death. He was beatified by Innocent XI in 1679,1 and solemnly canonized by Pope Benedict XIII in 1726. On the miracles wrought by his inter. cession, see Benedict XIV,2 and especially the acts of his canonization. A pastor of souls must be careful to animate all his exterior actions and labours in the service of his neighbour with the interior spirit of compunction, humility, zeal, charity, and tender devotion. Without this he loses the fruit of all the pains he takes, and by them will often deserve only chastisements in the world to come; so much will his intention and the affections of his heart be infected with self-love, and depraved by various imperfections, and secret sinister desires, even in the most holy functions. Therefore, a fervent noviciate, employed in the exercises of an interior life, ought to be a part of the preparation for this state; and in the discharge of his duties, a person ought always to unite contemplation with action, and reserve to himself sufficient-time for conversing with God and his own soul, and taking a frequent review of his own interior. From his labors he must return frequently to prayer, and constantly nourish in his soul a spirit of fervent devotion, which will thus accompany all his exterior actions and keep his thoughts and affections always united to God. Those who are not faithful in thus maintaining and improving in themselves an interior spirit of piety, and in watching with fear and compunction over the motions of their own hearts, will generally advance very little the kingdom of Christ in the souls of others, and are in great danger of losing their own. This is what St. Bernard feared in his disciple Pope Eugenius III, whom he conjured with tears never to give himself up entirely to the care of others, so as not to live also for himself; so to communicate a spirit of piety to others, as not to suffer it to be drained in his own heart; to be a basin to hold it, not a pipe for it to run through. This lesson is applicable, with due proportion, to other states, especially that of teaching the sciences, in which the exercises of an interior life are so much the more necessary, as the employment is more distracting, more tumultuous, and more exposed to the waves of vanity, jealousy, and other secret petty passions.